But There is No Such Thing as Canine Cancer in Doggie Heaven! I had an oh-oh with my health in late March 2014: I was diagnosed with cancer, a small malignant tumor in my abdomen near my intestines. Thankfully we caught it early. My tumor - which we named my Belly Booger - was removed, along with 10-inches of intestine by Dr. Louisa Asseo, DVM. I then received special cancer treatments (4 gentle chemotherapy treatments and other cool medicine) from my special cancer veterinarian, Dr. Martin Crawford-Jakubiak, MLAS, DVM, DACVIM (Internal Medicine and Oncology) at Sage Centers for Veterinary Specialty and Emergency Care in Concord, CA. My IV chemotherapy cancer treatments were completed, and initial follow-up ultrasounds showed I did not have any new tumors. I had no side effects from my IV chemotherapy cancer treatments, with the exception that I was a bit tired for about 2 1/2 days after my 2nd, 3rd, and 4th treatments. We were so glad we caught my cancer early and followed through with my vets' treatment recommendations. Unfortunately, we learned in mid-September that my cancer had returned in my spleen and a lymph node. I spent 2 days and 1 night in the Sage Centers Hospital in Concord, and started on a new specialized canine cancer tablet chemotherapy - Toceranib, also known as Palladia - and other medications. Our goal was to ensure a comfortable, good quality of life for me. I could tell that Daddy and Mommy were sad, so I told them "No worries, Daddy and Mommy. Don't be sad. I am comfortable. Let's just enjoy each and every day that we have." Enough said. And we followed through with our goal, giving me just the right amount of time on Earth before Heaven called upon me for important Canine Assignments on September 21, 2014. Although I am in Doggie Heaven now, my wonderful life goes on with my bestest Daddy and Mommy. We all continue to stay positive, love life, and enjoy each day to the fullest. Always remember: live in the present, as every day is truly a gift! Titus wears his light green Sage Centers bandana following Graduation from Chemotherapy Treatment on June 24, 2014. Congratulations Titus! Titus, the Daily Smiler on The Bark website. October 7, 2011. When I was on Earth, my Family and I lived life to the fullest; we always have and always will. I am continuing to live life to the fullest in Doggie Heaven. On Earth I enjoyed hanging out with Daddy and Mommy; we appreciated each and every day, and .. even though I am now in Doggie Heaven ... we will all continue to do so. After all, even though my permanent residency is now Doggie Heaven, I will nonetheless still always be with Daddy and Mommy. During my time on Earth, I liked to take meandering walks through my Pleasant Hill and Walnut Creek neighborhoods; nearby Larkey Park and the gardens in the Friends Church across from the park are my favorite meandering spots. If I got tired during my walks, I stopped to rest; no worries. I also liked to garden with Mommy, explore my back yard and front yard, supervise Daddy's lawn mowing, perform my watchdog duties, and take long naps. I really enjoyed it when Mommy groomed me. It felt so good to be brushed (I usually fell asleep! ); and I really liked having my teeth brushed and ears wiped out. I also enjoyed visiting beautiful Briones Regional Park, going on off-leash hikes and walks with Daddy. I so enjoyed my Senior Years on Earth. As I have got older, I was affected by "Old Dog-itis" as Mommy calls it. But then again, we are all grow older, don't we? We can only manage each day as best as we can! My walking pace slowed down, and I lost some feeling in my back legs which meant it takes me longer to get up and going. But none of that bothered me or my Family. My preventative care really helped all of this and allowed me to stay active: I took fish oil, Cosamin DS, Rimadyl (a prescription Doggie Motrin), and Denamarin (a canine liver support supplement). I also got an injection of Adequan every 3 weeks. While I did not much like getting this shot, the Adequan really helped alleviate Old Dog-itis stiffness in my legs. Although I now hear just fine in Doggie Heaven, during my time on Earth I became deaf due to age-related hearing loss (I could still hear a few things, like when Daddy sneezed); my eyesight was great. When I first started to go deaf at age 12 1/2, I was confused because I could not figure out why my ears did not work so well anymore. But with love and help from Daddy and Mommy, I adjusted to my "new ears" just fine. I tore the ACL (Anterior Cruciate Ligament) in my left rear knee in June 2008, and had surgery at Sage Centers for Veterinary Specialty and Emergency Care on June 19, 2008 to rebuild my left knee using the TPLO (Tibial Plateau Leveling Osteotomy) procedure. Dr. Timothy W.H. Sellmeyer, DVM, Diplomate ACVS performed the very successful surgery. In the Spring of 2009, I started to have discomfort in my right knee; I had ruptured my right ACL from wear and tear. On May 28, 2009, Dr. Paula West, DVM, Diplomat ACVS successfully reconstructed my right knee using the TPLO procedure at Sage Centers. Without these surgeries, I would not have been able to go on long walks, climb hills, chase crows (I really do not like crows! ), or comfortably climb our stairs ever again on Earth. My Family and I agreed that would not be a very good qualify of life for me. Both surgeries were extremely successful and my recoveries went very well. In fact, I was feeling so well after my second knee surgery in Mary 2009, Daddy had to stop me from running through the house only four days after my surgery. You should have seen how white Mommy's face turned when she was me start to run! Check out these X-Rays of my bionic super legs. Aren't my TPLO plates, 12 screws, and the pin in my right knee amazing? And oh, my legs are working just great in Doggie Heaven! I am lucky; Mommy cooked for me on Earth, and I am getting these same wonderful meals and snacks in Doggie Heaven! And yes, I have a hearty appetite. My favorite foods on Earth were Mommy's roast turkey (using a Diestel Turkey from the Diestel Family Turkey Ranch), Mommy's world famous roast chicken (an organic chicken is a must; Mommy buys Mary's Organic Chicken - sometimes a whole chicken, sometimes chicken pieces), steak, and Hebrew National Reduced-Fat All Beef Kosher Frankfurters (no pork in them, so did not upset my belly, and very easy to digest). On Earth we ate roast turkey year round; not just at Thanksgiving like some people. We eat roast turkey year round in Doggy Heaven, too! So delicious and, as Mommy says: "Great turkey re-runs!" Sometimes Mommy roasted a fresh whole turkey; other times she roasted a fresh bone-in turkey breast, or wonderful fresh boneless turkey breast cutlets. My other favorite Earth foods included Mommy's steamed organic brown basmati rice, fish (particularly sole and salmon), Mommy's homemade cookies, cream cheese, milk, and SPORTMiX Puppy Biscuits. On Earth I had snacks - otherwise known as rations - during my morning walks. And guess what! I have these same wonderful rations in Doggy Heaven. My current rations include SPORTMiX Puppy Biscuits broken in half, and small slices of frankfurter. I have a very soft mouth; I like my rations and food cut into small pieces. Daddy and Mommy always brought extra rations to share with dogs that we meet during our wonderful outdoor Earth adventures. Great dogs like my Earth friends Sonny, Sammie, Luna, Oscar, Rex, Quincy, Bandit, Roxie, Aggs, Trixey, Norrie, Angus, Layla, Tucker, Maya, Schroeder, Scout, Otis, and Buddy. I am meeting lots of new, great friends in Doggie Heaven. I am sure Daddy and Mommy will continue with this Earth-honored "share rations" tradition. Mommy's meals are so very delicious! For my meals on Earth I enjoyed a warm portion of protein (usually roast chicken or roast turkey, but sometimes steak or fish) and steamed brown basmati rice. My Earth meal dish was always placed on a cloth placement or napkin, so it is just as if I was eating with Mommy and Daddy! My extra special Earth dinner was Mommy's tender grass fed market steak or sirloin steak. I am getting these same delicious meals in Doggie Heaven. After my Earth dinner, I drank a bowl of 2% organic milk for strong bones and teeth. When Daddy, Mommy, and I went to bed at night, Mommy placed a bedtime snack of frankfurter slices next to my bedroom water bowl. Delicious! Today - September 21, 2014, my arrival date in Heaven - I learned that I get to enjoy the same routine and foods in Doggie Heaven. Fabulous! 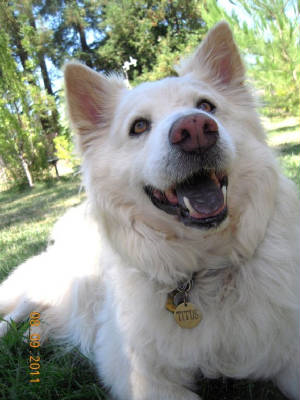 In Memory: Meet Titus the Dog! Greetings Everyone! My name is Titus the Dog, but you can just call me Titus. 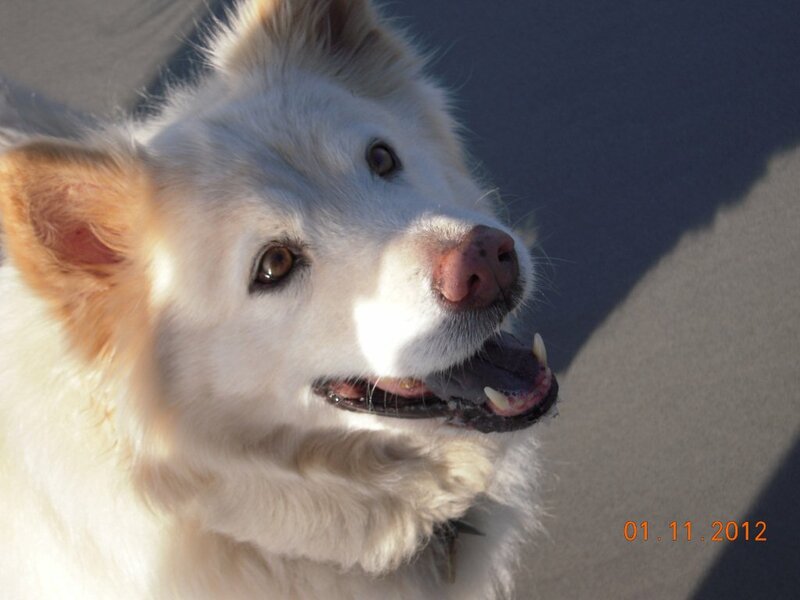 I am updating this page from Doggie Heaven on September 21, 2014. I embarked on my New Journey over the Rainbow Bridge early in the morning on September 21, 2014, at glorious age 14-plus years old. My rapid decline in health during the night, and "the look" I gave Daddy and Mommy, told all of us it was time for me to begin my new life in Doggie Heaven. I peacefully passed over the Rainbow Bridge in the Concord Sage Center's Quiet Room, while lying in my favorite Frontgate Dog Bed, with Daddy and Mommy at my side. Daddy and Mommy then Celebrated our Wonderful Life by taking a long walk in Briones Regional Park. I so love the trails and hills there; Daddy and I walked and hiked miles and miles in Briones. As Daddy and Mommy were walking on one of my favorite trails, they looked east toward the Diablo Range of hills and mountains. Just at that time, I opened up the low cloud cover that surrounded the Diablo Range and shined a few beautiful beams of glorious sunshine down onto the mountains, so that Daddy and Mommy would know that I had safely aand happily arrived in Heaven. As I had my hearty appetite back, I had breakfast as soon as I arrived in Doggie Heaven this morning - 2 large helpings, as Doggies do not gain weight in Heaven - and a chocolate chip cookie, as Doggies can eat chocolate in Heaven. Yum! I then traveled down to Earth in the beams of glorious sunshine and walked with Daddy and Mommy, staying just ahead of Daddy as I always did. And hey, my ears work again now! I heard Daddy's whistle when I got too far ahead on the trail, and knew to heel until he and Mommy got closer to me. I chose my Daddy and Mommy (Jim and Mary) as my Forever Family when they visited the Contra Costa Animal Shelter in Martinez, California on June 18, 2005. I was temporarily staying there, patiently waiting for my forever family to arrive so I could adopt them. My name was Titus then; Daddy, Mommy, and I decided to keep it. In honor of this very special event, we celebrate the third Saturday of every June as Titus Day. 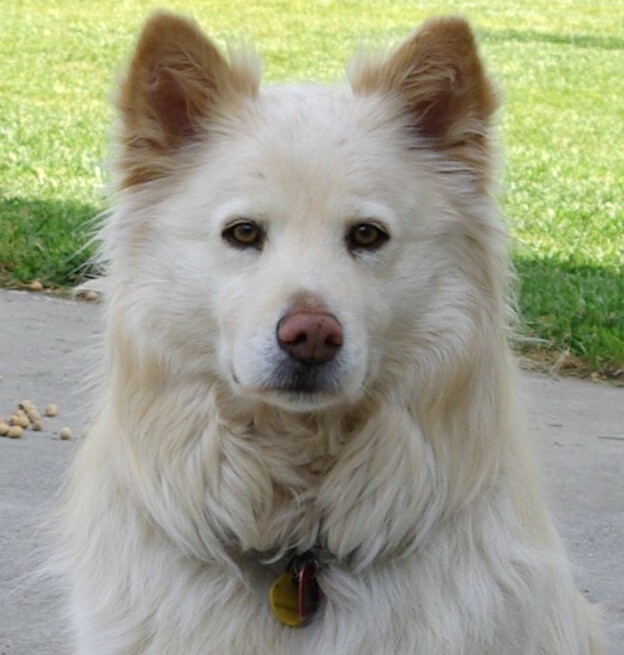 I am a Chow Chow mix, most likely Chow Chow-mix, likely a Chow Chow-Samoyed and mayb-a-little-something- else mix. I am proud to say that I am a Mutt. As Mommy says, "There is nothing more lovable than a Mutt!! I turned 14 years old on my last fabulous birthday on July 30, 2014. We took a (human) birthday cake to my primary vet to celebrate this wonderful occasion. My family and I enjoyed taking dog-friendly road trips to beautiful Carmel-by-the-Sea, an easy 2 hour car drive from our home. I loved the Earth's Pacific Ocean! And man, you should see the awesome Oceans in Doggie Heaven .. perfect waves and sandy beaches! We stayed at Doris Day's wonderful Cypress Inn during our visits. We were always warmly welcomed back by the Inn's staff. Carmel is one of the most dog-friendly and human-friendly places on Earth. Be sure to visit sometime!